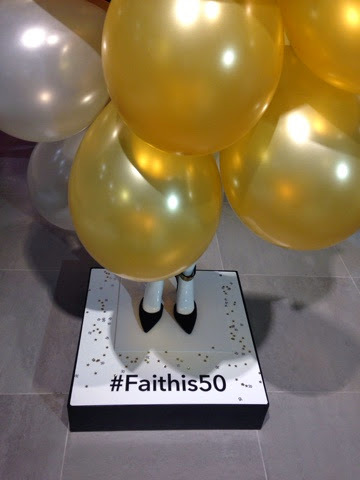 This evening I joined the gorgeous team at Debenhams to celebrate Faith's 50th Birthday and get a sneak peak at SS15s collection. 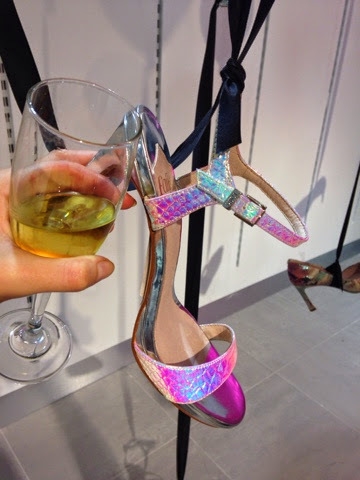 Pastels and metalics adorned mules and sandals with my favourite pair having a pink suede and snake skin colour way. 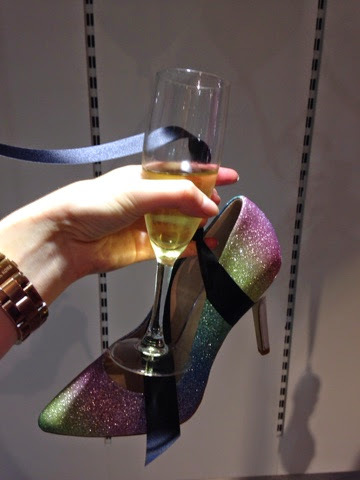 Here's to another 50 years of great High Street shoes. I know I really shouldn't wish away this beautiful Indian Summer but all I want to wear right now is oversized knits, boxy coats and high, high boots. This Topshop black suede over-the-knee variety just had to make the cut and are my new favourite item. 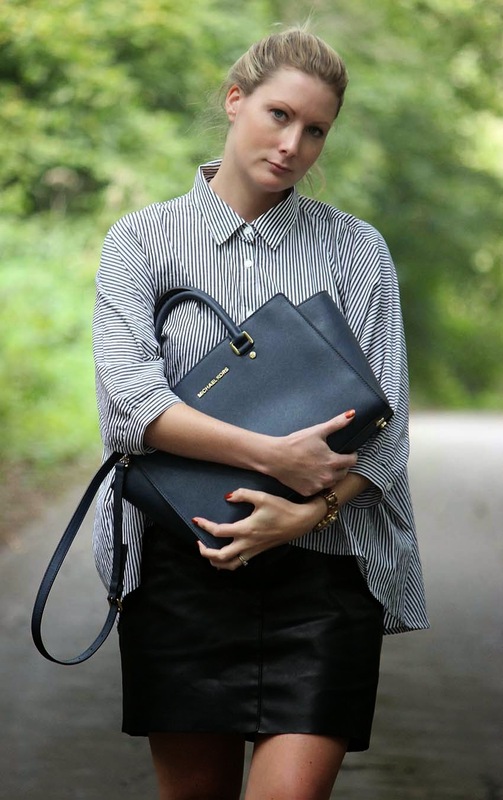 I had to leave the knitwear for now so threw on this Forever 21 pinstripe oversized shirt and Zara leather shirt - both in store now. I'm also adoring my honeymoon treat Michael Kors navy leather satchel. Oh I do love Autumn. I wore Uggs. I would 'slouch' in my Chestnut Baileys with a pair of overpriced sweatpants whilst drinking buckets of tea in my University house. I wore them out. Forget that. 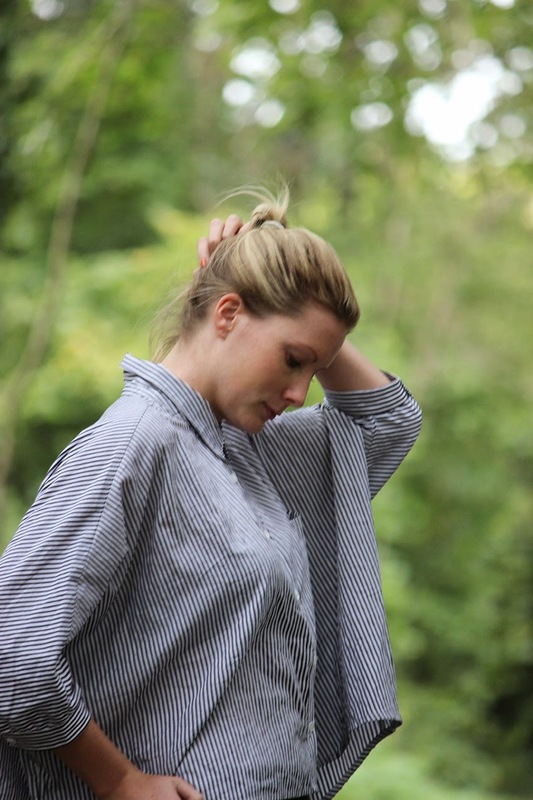 Forget preppy students and definitely forget sweatpants. Flicking through the pages of glossy Autumn magazines I kept coming across adverts with models sprawled out on sheepskin rugs in gorgeous interiors wearing Uggs in a far more French way. 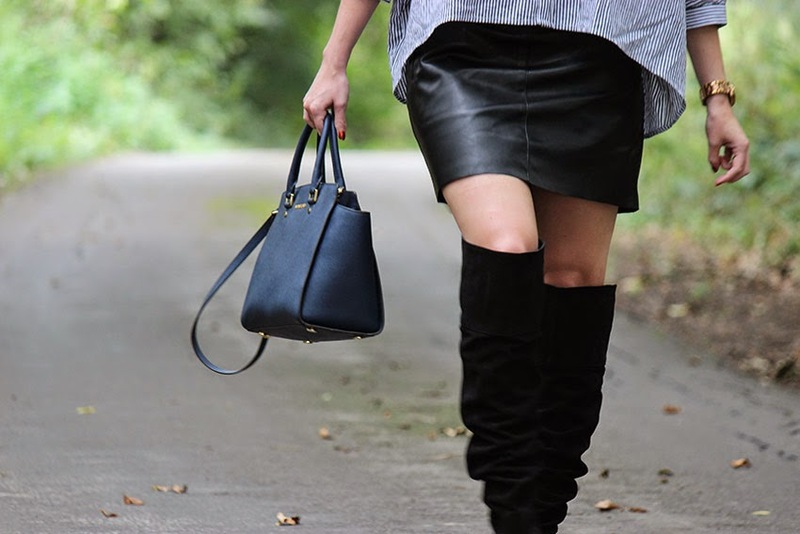 This season pull on your skinny leather leggings, and oversized luxury vest, your best bed-head hair and finish with a pair of the brands sheepskin boots. 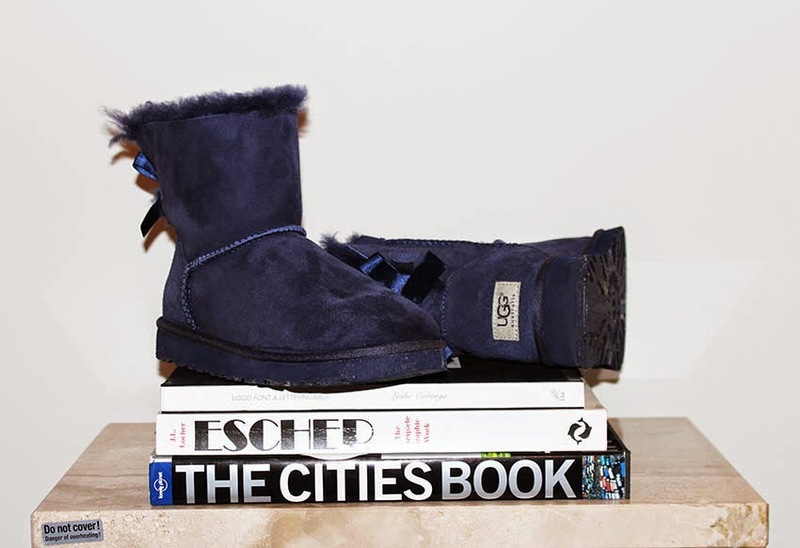 Uggs are probably THE most comfortable shoes available and in the depths of winter nothing beats them for cosy commuting. Pick up a pair in rich bottle green, peacock blue, black or snakeskin for an entirely new feel. I am adoring my Mini Bailey Bow in Peacoat and will be styling for Autumn with a studded cuff and black eyeliner. In Canada the weather changes far quicker than here. You can wake up to 3 inches of snow and yet by midday you're sunbathing next to turquoise lakes in 32 degree sunshine. It's something to do with the mountains and they are used to it. Layers are key and sometimes you just get cold. I mention this as I have just returned from a few weeks road tripping across the Rockies. Living out of a suitcase for that long limits your fashion choices and really makes it easy to throw on suitable attire, and pack a jumper incase. Now I'm back with a bump to early starts, dark cold mornings and strangely hot days in London Town. Whether it's due to the pages of oversized coats and 70s boots in Vogue or the rails of deliciously cosy knits on the High St, I have spent the past two days cooking. I was sure that dark mornings and golden leaves meant thick tights and skinny jeans. It did not. Today I have returned to bare legs and unless we grow some mountains and I start waking up to snow I think it will stay this way for a while. In the early hours I threw on a Zara leather mini skirt and mules, Michael Kors breton tee and my saviour by celebrity makeup artist Bethany Karlyn - Prtty Peaushun. This incredible product was made for times when the weather is warm yet the tan has faded and legs lack lustre. This natural moisturiser contains light reflecting particles that hide imperfections and give legs a heathy summer shimmer. This wonder product also contains natural plant extracts to lift, tighten and diminish the appearance of cellulite, stretch marks, veins and bruising. Prtty Peaushun is easy to rub on, not like fake tan, even though it does come in different shades, and isn't glittery so great for every day. You don't have to keep this gem for just legs either, being natural you can glow from face to toe. I will be keeping this little find in my beauty essentials wherever I go. 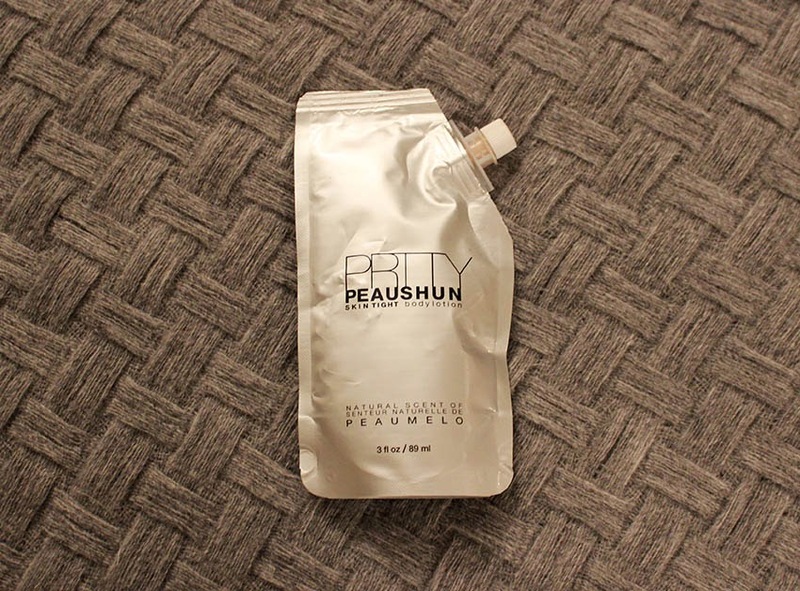 Pick up Prtty Peaushun online at Beauty Works West - www.beautyworkswest.com.